What are Card Linked Offers? Basically, they’re digital coupons—offers from specialty retailers that you can easily load straight to your debit or credit card. When you shop at the store simply swipe your card and the savings will show up as a cash-back refund on your card account statement later. No paper, no printing, no codes to copy and paste—it’s hassle-free! Why use Card Linked Offers? It’s like getting free money! Adding an offer to your credit card is as easy as a click, and you can do it on your mobile device or desktop. 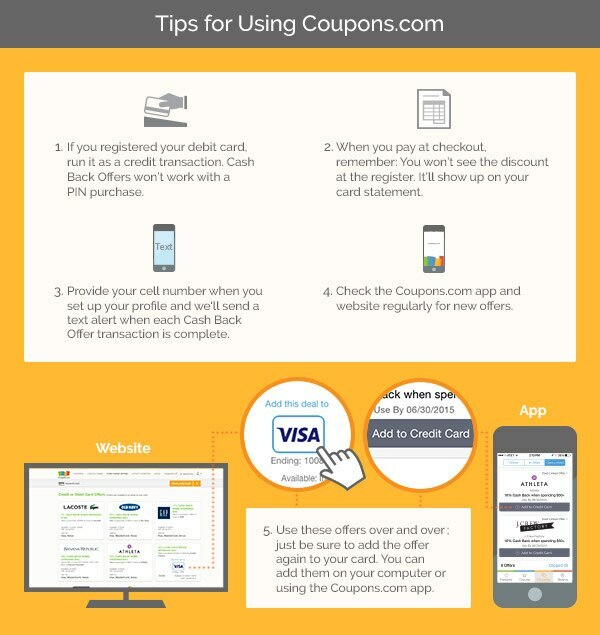 With the Coupons.com mobile app, adding a Card Linked Offer to your credit card is as easy as a single tap. You never need to print, clip or remember your coupons. There are no codes to search for or rebates to mail. There’s no slow-down at the register or confusion about coupon redemption policies. The rewards are simple, usually given back as a percentage of your purchase. You can also find rewards that give back a specific dollar amount on a minimum purchase. Ready to start? View Card Linked Offers.